On our road-trip through the South of France, our last home base was in the beautiful town of Cap d’Ail, which conveniently neighbors Monaco. 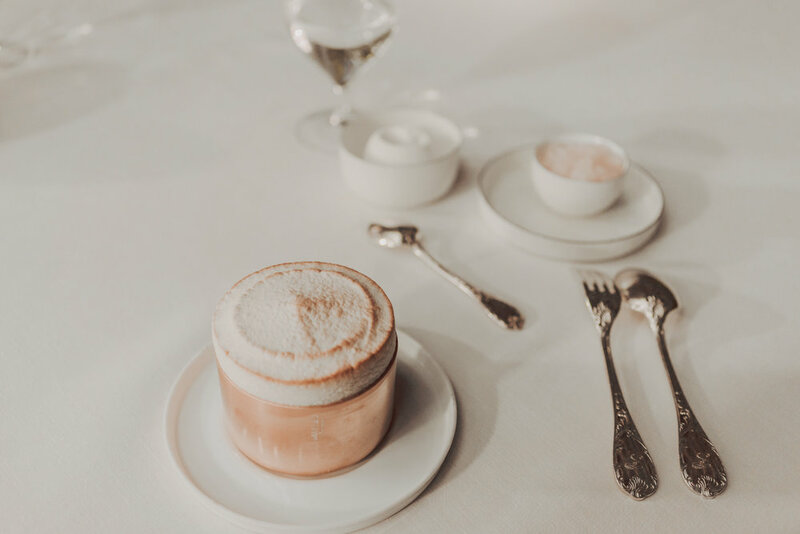 Although we didn’t have time to explore the lavish city of Monte Carlo, my boyfriend and I did, however, stop by for an unforgettable dinner at Alain Ducasse Le Louis XV in à l’Hôtel de Paris. The three Michelin stars restaurant offers a unique culinary experience inspired by the flavors of the French Riviera. The menu, created by chef Dominique Lory – current chef of the restaurant – and Alain Ducasse showcases the real character of the ingredients. While the menu offers flavors and colors of the Riviera with uniqueness and youth, the restaurant was established in 1987 and has a long history in the culinary world - showcasing the chefs’ talent of evolving creativity. Le Louis XV was recently relocated from a grandiose French belle époque dining room to a modern yet elegant room temporarily while the Hotel de Paris undergoes renovation. I was initially disappointed when I found out, as the photos I have seen of the restaurants were gorgeous. But the outside patio of their new location made up for the disappointment. We initially sat inside, but right before dessert, the chef de salle must have noticed my intense stare at the outdoor table and asked if we wanted to switch – we jumped at the opportunity. The restaurant offers two set-menu and a la carte. 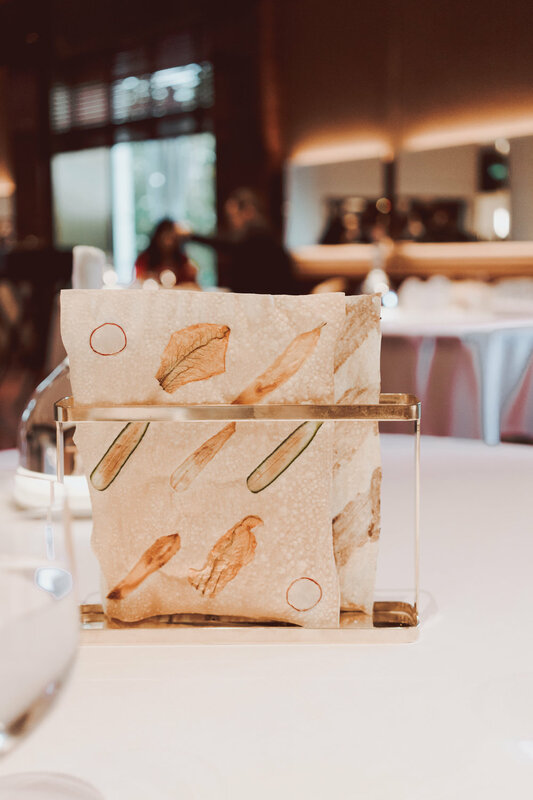 As we were making our selections, we were presented with two flatbreads - one with delicately embedded flowers and vegetables, and one flavored with a few delicate brushes of tapenade. Menus out, and the amuse-bouche started rolling in. The first one was bite-size spring rolls with a black olive dipping sauce. Then followed by raw fish in a bed of hot rocks. Once the dish was placed on the table, water was added to the bed and quickly covered to steam the fish gently. 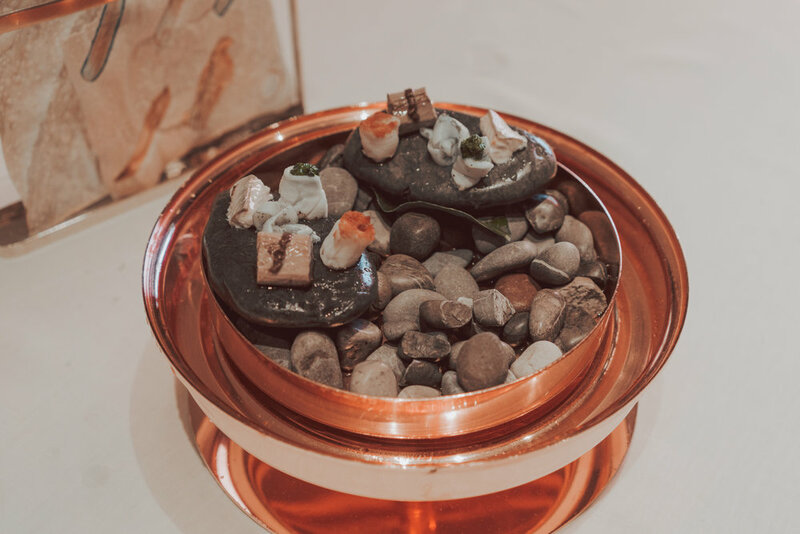 The selection of seafood included skipjack tuna paired with black olive, mackerel infused with lemon, mullet topped with basil, cuttlefish with capers, and gurnard. 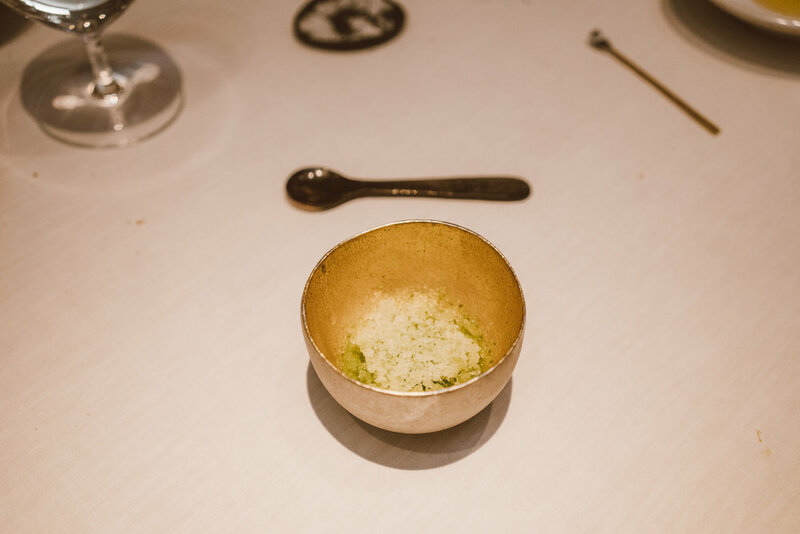 Afterward, our dishes started to parade to our table like clockwork with a flock of waiters making sure every detail is in place - all under the vigilant eyes of the chef de salle. The course that won me over: Chilled melon broth, lemongrass, ginger, and a blue lobster. Still high on my obsession over Provençal melon, I selected the melon broth without thinking twice how the sweet fruit would pair with lobster and ginger – and my trust paid off big time! The sweetness of the melon blends exquisitely with the ginger and lemongrass, complementing perfectly the delicate flavor of the fresh lobster – perfection! For our main course, baked locally caught fish with fennel, saffron, and local citrus. 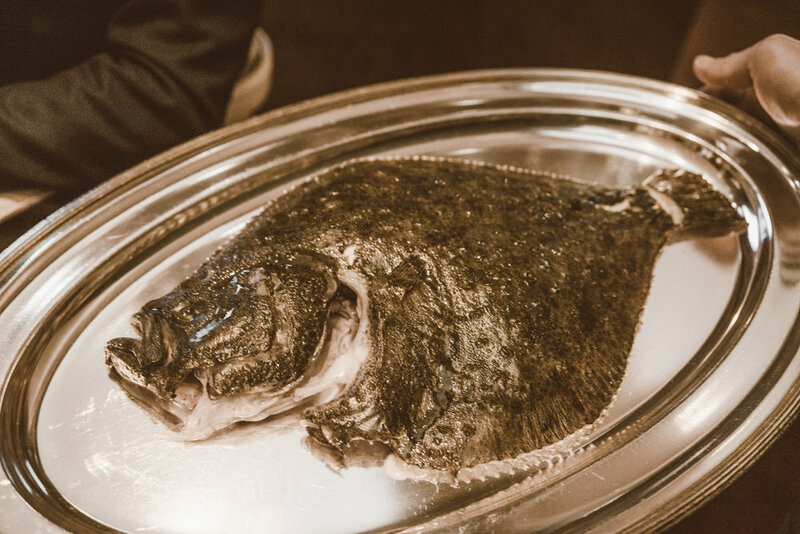 The local fish in question: turbotin – French’s name for a young and smaller turbot. The delicate flavor of the fish was paired with an equally delicate broth and accompanied by vegetables placed on creamy citrusy sauce. And then dessert! But before that, palate cleanse with a citrusy and sweet granita. For dessert, I ordered the strawberries from Carros, delicate milk cheese and vanilla. The strawberries gave the right amount of sweetness and tartness to the creamy cheese, and to top it off, strawberry ice cream. The next treat, a selection of lemon, kumquat, ginger, and sugar candies - and just when I thought dinner was over, chocolate truffle! As we leave the restaurant, the hostess at the front desk presented me with a gift! A box with a beautiful graphic, which I initially thought, was a circus clown but now looking at it closer it’s a panettone! And inside: a delicious chocolate chip panettone with sugar crust top that I couldn’t get enough of. Serious question, where do I get more of it? 31 years later, Le Louis XV excellent food still resounds through the culinary world. Tell me, what’s your favorite restaurant? Your mouth watered as you read this post? Pin it!